Salvaged materials are torn, painted and re-assembled to create mixed media pieces drawing their inspiration from the landscape and the everday..Since 2005 she has run courses for the Edward James Foundation at West Dean College where she was also resident artist. Her many-layered, atmospheric pieces are collected and commissioned internationally including pieces held by the Museum of Art and Design New York, the Embroiderer's Guild UK and the Garden Museum, London. 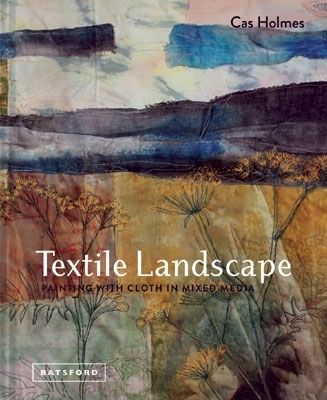 Supported by Arts Council England her one person show Urban Nature (first shown when she was a guest artist at the Knitting and Stitching Show) led to a major exhibition at the 20th Anniversary of the European Patchwork Meeting and the Lace Museum in the Netherlands. Cas Holmes fascination for the landscape is reflected in her work, both in its subject matter, which explores the intersections of the spaces life inhabits: the green spaces in urban areas, the verges of highways, the trees in a city park; and in its techniques of joining cloth and paper.